Derrick Rose will reportedly be out for the season after suffering a torn meniscus tear on his right knee, the Chicago Bulls PR team have announced. Rose has been averaging 18 points, 5 assists, and 3 rebounds while trying to regain his old form that made him the youngest MVP in 2011. Support for the young star has been pouring from all around the league, with LeBron James and John Wall offering their prayers. The good news? It’s not career-ending. 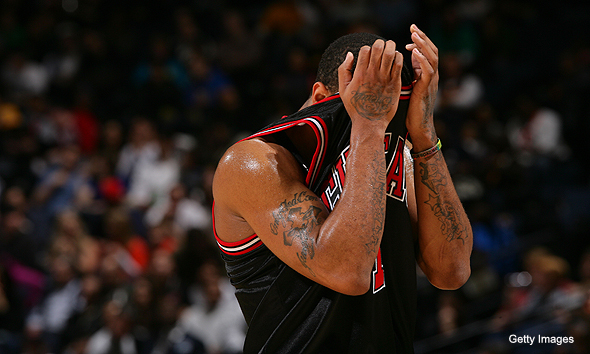 Rose will have two options regarding his meniscus: remove or repair. How important is the meniscus? Imagine that you and your bed are connecting bones. The meniscus is the pillow. Basically, you can still sleep, but without the pillow, it hurts. The meniscus on our knees absorb the pressure created when we’re walking or running. Think how important the meniscus is to an athlete who runs and jumps on a daily basis. An athlete can still perform at the highest level though, even after removing the meniscus. It speeds up recovery. Derrick Rose could certainly be back just in time for the NBA Playoffs. But like Dwyane Wade, who had his meniscus removed during his college years, it comes at a hefty price for your long-term health. Up to this day, Wade regrets that decision he made regarding his injury. Another option they could do is repair it. Doctors would clean off the torn part, and stitch it at the point where it tore. It could also mean the end of the year for Rose, who had the same procedure last year, when he suffered a meniscus tear in Portland. Eric Bledsoe also followed suit, and has been playing well for Phoenix. Most notably to do this was Russell Westbrook, who had 3 (!) surgical procedures last year on the same knee and sat out for 2 months, but still managed to recover his tenacity and is now part of the MVP discussion. The next couple of days would be very important for both the Bulls organization and their franchise player. How bad is the injury? How long will he sit out? Is he the next Brandon Roy, who had to retire prematurely? Can he ever come back? These are some of the questions we could answer once we have more information about his meniscus. As for the Chicago Bulls, it’s not over. Atlanta and Cleveland are feeling well right now, with one of their rivals going through the season without their best player. But the ascension of Jimmy Butler and Tony Snell, the resurrection of Pau Gasol, and the tenacity of both Joakim Noah and Tom Thibodeau can not be overlooked. Never count them out. Same with Derrick Rose. This entry was posted in Basketball, NBA and tagged Bulls, Chicago, Chicago Bulls, Chitown, Derrick Rose, DRose, injured athletes, injury. Bookmark the permalink.